Weekend & School Holidays courses. 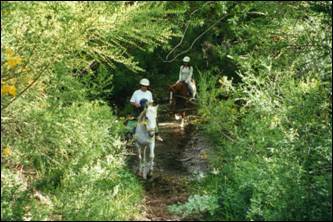 Courses include accommodation, meals, all horse riding lessons and trekking from $80.00 day incl GST. with courses most weekend's throughout the year, low cost, shuttle from Christchurch* and quality instruction, no wonder so many people choose to ride regularly at Kowhai. Regular riders can join Pony Club, sit certificates, go to competitions and enjoy riding quality horses in a safe country environment. 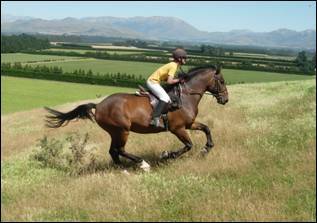 All instruction follows Pony Club lines and is overseen by Liz Thomas ESNZ grade II coach and Rebecca Thomas NZPCA A & H certificate & NZPCA 2017 coach of the year. All senior staff hold current work place first aid certificates. We usually run three groups so there is a 'beginner' group, 'intermediate' group and 'experienced' group. 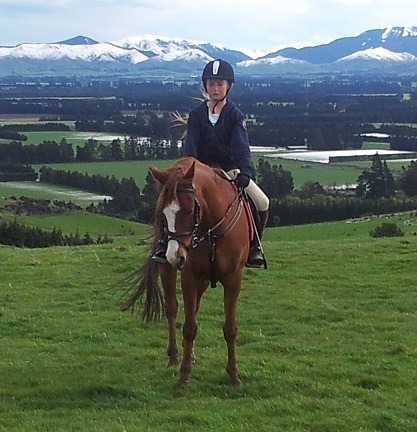 Yes you can bring your own horse or pony to Kowhai. All riding is fully supervised at all times and both adults and unaccompanied children from age 8 are welcome. Riders enjoy learning everything from the correct way to catch a horse, to grooming, saddling, bridling, mounting and basic control of the horse to Dressage, Show Jumping and Cross Country for experienced riders. These courses run like a school camp so some help with meal preparation, cleaning, sweeping or teams jobs will be required. All riders clean their own gear, yard area and room. Comprehensive Health and Safety Plan in place. Typical daily schedule for courses at Kowhai. 0800 Breakfast eaten in the dining area. 0900 Catch horses under Kowhai Staff supervision / instruction. 0915 Groom, pick out hoofs, and help with saddling & bridling their horse. 1000 Mounting and riding to the arenas. 1200 Lesson finish – horses fed and unsaddled etc. 1300 Lunch eaten in the dining area. 1400 Horses re saddled & bridled. 1630 Ride finishes – tack cleaning, yard cleaning, grooming and putting out horses. 1900 Dinner in the dining area. When staying on a 5 day course Wednesday is usually a sleep in for both horses and riders – with riding in the afternoon only. All riding is subject to fine weather and safe operating conditions, in high winds or heavy rain we teach horsemastership inside. 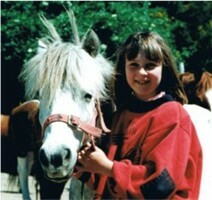 It's also possible for children to stay outside School Holiday time, we farmstay many overseas children every year. 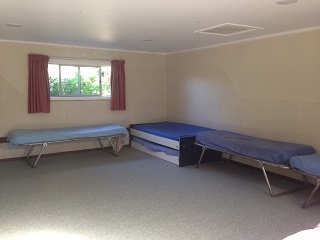 Heated bunkrooms with boys and girls separate, similar age children or friends will be in the same room. Kowhai's bunkrooms have a current council building warrant of fitness and fire evacuation scheme in place. If you have a special dietary need eg. Vegetarian it will be necessary for you to bring some food as we only prepare one type of meal for everybody. 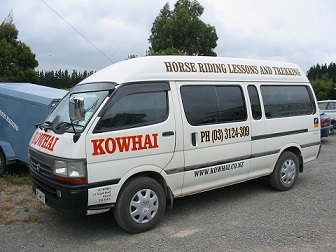 Kowhai has a private shuttle that runs Friday & Sunday evenings 6:30pm from 100 Straven Rd in Riccarton. with a passenger endorsed driver. Horse riding is only available subject to fine weather and safe operating conditions - We reserve the right to cancel any horse riding on days where circumstances beyond our control would affect the safety of horses and riders, there is no reduction in cost should this take place. Guests staying on the 5 day course usually rest on Wednesday morning so riding is only available on Wednesday afternoon. Some help with meal preparation or cleaning required in return for the low price. All bookings must be pre-paid and are not refundable. Shuttle costs $25.00 (child) return and departs from 100 Straven Road in Riccarton at 6:30pm Friday & Sunday evenings & is limited to the first 11 people booked. If you have a special dietary need eg. Vegetarian it will be necessary for you to bring some food as we only prepare one type of meal for everybody.